An all-women hackathon is helping support young women interested in the field of computing. The annual WiC Hacks event will be held Feb. 25 and 26 at RIT. The Oscar-nominated hit film Hidden Figures isn’t the only thing bringing light to the gender gap in the technology industry. 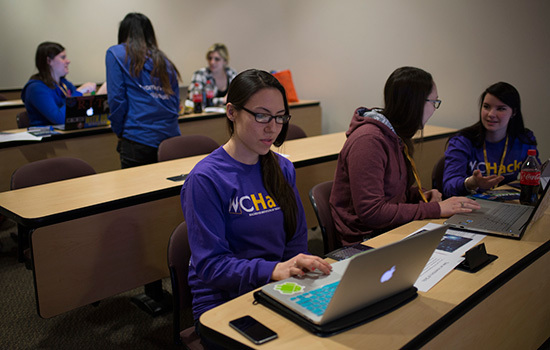 WiC Hacks, an all-women hackathon hosted at Rochester Institute of Technology, is helping to drive the movement by creating more opportunities for young women to thrive at computing in high school, college and beyond. The free collaborative programming event creates an inviting and encouraging environment for young women to explore the world of technology, to learn something new and develop the confidence needed to succeed in a competitive tech industry. The fourth-annual WiC Hacks event will be held Feb. 25 and 26 at RIT. For the 24-hour hackathon, teams work together to create mobile apps, websites, games and other software that provide unique solutions to problems. The event is open to college and high school women of all skill levels—from those who have never programmed to coding experts. For all the progress women have made in STEM careers, the gender gap in computing is only growing larger. Since 1990, the percentage of female computing professionals has dropped from 35 percent to about 24 percent today. If that trend continues, the share of women in the nation’s computing workforce will decline to 22 percent by 2025, according to Girls Who Code. WiC Hacks will include a Newbie Track for students who have no programming experience. Over the course of the hackathon, students will get to learn how to code, acquire the basics of a programming language and produce a project. The Newbie Track will cover web development featuring HTML, CSS and Git. After 24 hours of project building and hacking, students will be able to showcase their work for judges and other participants. An awards ceremony will take place at 2:30 p.m. Sunday. In addition to the competition, students will get to take part in workshops, hear tech talks and meet with mentoring women in the technology industry. Companies sponsoring and attending the event include Intuit, Google, Red Hat and HubSpot, among others. More than 200 women are already signed up for the weekend hackathon, including teams from Ithaca College, RIT and University of Waterloo. WiC Hacks is open to all female college students and high school students who are at least 16 years of age. Meals and snacks will be provided for participants. Registration for individuals or teams can be done online. For more information, go to wic-hacks.rit.edu.